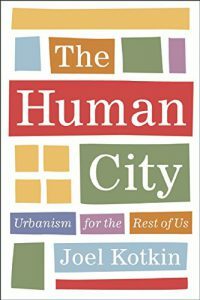 Direct, accessible, and thoroughly researched, The Human City reminds us that we are not just the products of demographic and economic forces, but that we can also shape the future we wish to inhabit. Nearly a century ago, in 1920, the Census Bureau caused a ruckus when it announced that for the first time a majority of Americans lived in cities — even though its definition of a city included every hamlet with a population of 2,500 and above. Today a majority of Americans live in what are by any reasonable definition very large cities, metropolitan areas with populations above 1 million. But the urban planning profession remains fixated on just one small portion of these metropolises, the central city downtowns, though none outside New York contains more than 10 percent of metropolitan area jobs. Joel Kotkin makes the argument that we need densification downtown and dispersion on our suburban edges if we want continued economic growth. Kotkin’s unlikely to be invited to talk to a banquet hall full of Hamilton urbanists. Yet he makes a convincing case for why doubling down on densification while restricting dispersion in suburbia is a bad idea. [The] kinds of places that are getting it right . . . we might call Joel Kotkin cities, after the writer who champions them. These are opportunity cities . . . [that] are less regulated, so it’s easier to start a business. They are sprawling with easy, hodgepodge housing construction, so the cost of living is low. . . . We should be having a debate between the Kotkin model and the [Richard] Florida model, between two successful ways to create posterity. 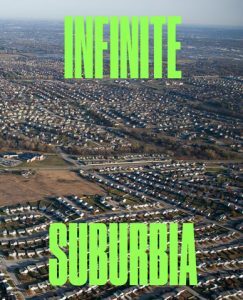 Edited by Alan M. Berger and Joel Kotkin, Infinite Suburbia is the culmination of the MIT Norman B. Leventhal Center for Advanced Urbanism's yearlong study of the future of suburban development. Around the globe, most new urban development has adhered to similar tenets: tall structures, small units, and high density. The Human City questions these nearly ubiquitous practices, suggesting that they do not consider the needs and desires of the vast majority of people. In a way not seen since the Gilded Age of the late nineteenth century, America is becoming a nation of increasingly sharply divided classes. 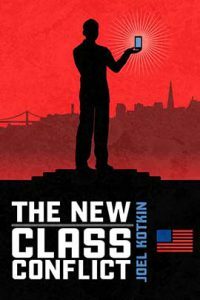 Joel Kotkin's The New Class Conflict breaks down these new divisions for the first time.